If your subscription plan does not allow for automation of Time in Lieu or RDO conditions (available on the Advanced/Plus plan), you are still able to set the system up to manage this. There are 2 scenarios for entering RDO/TIL. The first is via the earnings lines in a pay run, and the second is through the use of timesheets. Then, to ADD LEAVE once you have created the pay run, open the employee's details up by clicking on the arrow next to their name. Then in the bottom right hand corner you will notice a button called "Actions". Select the "accrue leave" option and simply add the hours you want to accrue for that employee to the leave type, i.e RDO or Time in Lieu. In order to TAKE LEAVE simply do the same as above but, instead select "take leave". Then select the leave that is to be taken i.e. RDO or Time in Lieu. If a work type is not selected the default pay category on the employees' Pay Run Defaults page will be used. You will need to create one work type for 'Ordinary Hours' and create another work type for 'RDO/TIL accrual' (which is set to 'accrue leave' for your RDO leave category). Your employees would then fill in the RDO/TIL accrual time manually when they enter their timesheets (for example, if they work 8 hours, they might enter 1 timesheet for 7.6 hours of Ordinary Hours and 1 timesheet for 0.4 hours of RDO/TIL accrual), or rather, 9am-4:36pm Ordinary Hours, 4:36pm-5pm RDO/TIL accrual. If using timesheets, when an employee wants to take RDO/TIL that they have accrued they can do this by submitting a leave request . This can then be managed and applied to the pay run by the appropriate user. 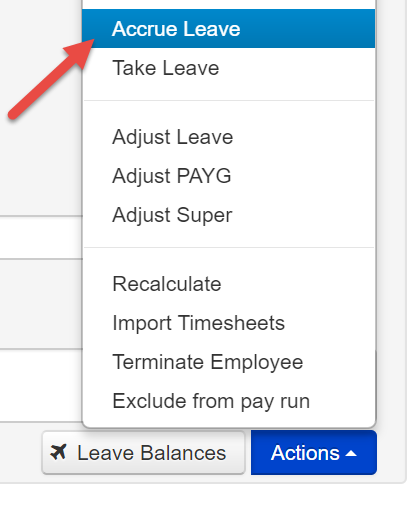 Alternatively, if there is no leave request, you can select the 'actions' button within a pay run and select 'take leave'.